There’s been a lot of discussion of late regarding a new temple fund that both members and non-members are donating to. Before the LDS Church established tithing as the mechanism to pay for temples, “temple funds” were very common. In the early days of the Church and according to Malachi, tithing was for the purpose of bringing “meat into the storehouse” so as to care for the poor. Whereas a temple fund was for the purpose of building “a” temple. Once that temple was completed (i.e. Kirtland), the temple fund was no longer needed. Of course today, the Church has decided to bring the temples to the people. This is a subject for a different day, but suffice it to say that this idea does not seem to reconcile with scripture nor with anything Joseph Smith taught. There is no prophecy I know of that says temples will dot the earth, from Joseph, Jesus, or in the Holy Scriptures. The prophecy as I understand it, is to build temples in two places, New and Old Jerusalem. Understandably there are many who are worried that some random group starting a temple fund seems premature at best and inappropriate (and/or crazy) at worst. After all, “we don’t have the authority to build a temple or to create Zion, that’s the Church’s stewardship”… right? I can certainly relate to those who have concerns about this project. On one hand, it’s amazing to think that at some point if we’re lucky enough in our lifetime, a new temple will be built in the New Jerusalem on this the American continent. And a city will be built up to the Most High God called Zion. Like many of you, I’ve yearned for this day and have prayed many times that me and many others would be so lucky to live to see it. On the other hand, what if this is all a hoax and people are being led astray? Like many of you, for most of my life I’ve assumed the Church would build both temples in New and Old Jerusalem and would establish Zion. Brother Nibley was always cordial about my questions but would usually quickly act as though he had other things to do. My questions and ideas are very different today however. I do not seek to offend anyone reading this, but I don’t see the Church as currently being capable of building Zion. Nor do I see Zion being in Independence, Missouri. And sadly, I don’t believe that a prophet, like an Isaiah, or a John the Baptist, or Joseph Smith can rise up in leadership in the Church today. And so how will it work? How will it all happen? How will Zion come to pass and how will a city and temple be built? To be completely honest, I’m not sure. What will the forerunner of the Messiah’s second coming look like? What will he say and do? How many will believe that messenger or those servants that are sent? I’m generally a skeptic. Like many of you, I’ve been disappointed by men many times before. But if a group of people seek to raise funds to build what they believe will be the Temple of the New Jerusalem, why should I want to stop them? Or want to see them fail? I’d rather be foolishly trying to support Zion than to accidentally fight against it. Let’s say for example that the people involved in this project raise $5M and end up running off with the money. Or build some strange building that looks like a compound in Waco, Texas. For me, that would be a great way to see if the Lord is truly in this effort or not. I’m assuming the Church has wasted our money in the past. Why would this be any worse? If this is from God, we will know soon enough (Acts 5:38). Some of you may be especially sensitive to the concept of church waste since just this last week we discovered that the Church leaders are paid very healthy salaries. At least $120,000 each, putting our “lay ministers” in the top 10% income bracket in the U.S. Add amazing health insurance and life insurance and pensions and social security benefits and reimbursed travel and food and education for their families and book royalties to this package and these “lay ministers” cost us tithe-payers (directly or indirectly – it’s all the same source of money) more than $5 million a year that’s for sure. The saddest part about this is that most of us have been led to believe or have been told that our church leaders are not paid anything. See Thomas Monson website as one example. So for me, giving to this effort seems to be a no-brainer, especially given that it can be done anonymously. I’d certainly consider giving money to a homeless person to build a house. Or to any sincere group of people trying to raise money to build a synagogue or a church building or Masonic Lodge or a food pantry. No one here is being asked to sacrifice their china, sell their home or their cars. No one is being asked to make a sacrifice that hurts or to even donate at all. So why not? Why not give to this effort and see what happens? What would be the worst thing that could come from it? I love the quote from Joseph Smith who said “It is better to feed ten impostors than to run the risk of turning away one honest petition.” I’d rather give in this case than not, just in case this is the Lord’s project. In fact, it would be a great strategy for the Church to fund this project. It would be the quickest way to see if this movement is from God or not. The Church donates money to other organizations all the time — to Catholic Charities, the Red Cross, to rodeos, businesses, posh theaters, and to the BSA etc., all of whom by the way, have motives not always aligned with our own, or with the church’s vision of building Zion. So why not give? What do we have to lose? If 100,000 people all give $100 to this effort, they’d raise $10,000,000, which I’d think would be enough to buy some land and build a temple. Would you pay $100 to find out if this effort will lead to Zion? I would. This entry was posted in Main and tagged Church leaders, Jesus Christ, Joseph Smith, Temple, The Poor, Tithing, Zion on January 13, 2017 by Bishop Anon. Let’s be transparent. Is this Denver’s temple? What ordinances will be performed there? AB: you have mentioned in the past you had several GA’s in your Ward. Were they in your Ward when you were Bishop, and if so, were you aware of their income levels at tithing settlement? I like your thoughts on this. I’ve also been on the fence. I’ve just woken up in the last 6 months so everything seems a little shaky right now. I too would love if this were real and if they were actually trying to build Zion. I’m still praying about it but your post just may inspire me to donate a bit. Thank you for your blog ? Good question Tom. In my case the general authorities paid tithing directly to the church and so I couldn’t see that. I could see their fast offerings which were paid to the ward. I think the other benefits you speak of take the average GA to well over 200k in annual increase. I will say that I asked a newly called mission president, who I had recommended, if he would be paid. He became very upset with me said he was not allowed to discuss it. While he was gone however his income or benefit was never reported back to our ward. I’m guessing he paid directly to the church as well at that point. I can tell you how much I think CES folks make. And I’m guessing they’re salary and benefits are close to the GAs. This is kind of an interesting discussion. For the longest time this blog has been posting strong evidence of the apostasy of the Church. So why all of a sudden the change to accepting what the Church or members are doing? What are the temples today? Are they accepted by the Lord? The past essays clearly point out that there is no revelation today. And there is no scripture as you indicated that says there will be temples dotting the earth during the Millennium. Quite the contrary! There will be only one place on earth during the Millennium where the ordinances will be done and that is at the New Jerusalem. There will be no temples anywhere else in the world. This is all prophesied in the latter chapters of Ezekiel and other books of the bible. So what are the temples today in the Church? Every one of them was not built through revelation, and have all been defiled. How have they been defiled you ask? Many ways let me go down the list. Those who are not to enter the temple have been invited in such as the blacks. The blacks are forbidden from entering the temple (Zechariah 14:21). Idols of Christ have been place in the entrance to the temples in violation of the 2nd commandment “Thou Shalt NOT make unto thee any graven image”(Exodus 20:4). This is speaking about our idols of Christ or the Christus. These abominations have defiled the temples. All of the temple ordinances except for baptism have been changed and altered. This has also defiled the temples. Joseph Smith said that the ordinances were not to be changed. They all have been and are now invalid (Isaiah 24:5). So are all of these changes to the Lord’s House acceptable to the Lord? Of course not! They will all be destroyed before the Millennium even begins. The ancient destruction of the temple is a type of what is coming. 10. Thy holy cities have become a wilderness; Zion is a desert, Jerusalem a desolation. 11. Our glorious holy temple where our fathers praised thee has been burned with fire, and all places dear to us lie in ruins. Only the New Jerusalem will have the temple because that is where the Lord will be during the Millennium. Yes at some point there will be a cleansing of the Church to purge it of the apostates that have taken over the leadership. So what are the temples today? They are like the pagan temples raised to Apollo in the ancient world. These pagan temples dotted the landscape in the ancient world. Today the Church builds temples without revelation and authority. I guess if you want to give money to such a project that is up to you. But the scriptures in my view are clear that it is a waste of time and money at this point. Best thing to do is wait until the Lord corrects the apostasy and establishes the true undefiled ordinances again. In addition, Joseph Smith originated the idea of temples being paid for with tithing. 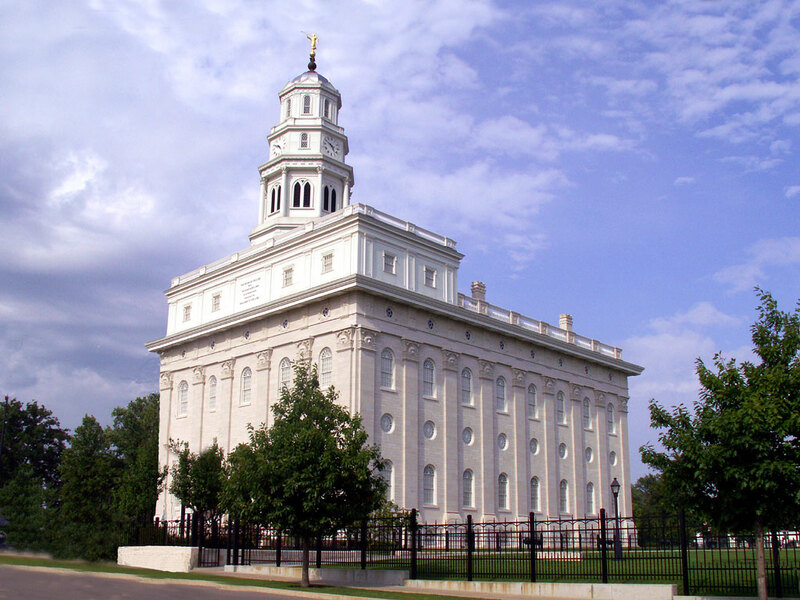 D&C 119 is likely the revelatory basis for Joseph’s policy to use tithing, from income or time, to build the Nauvoo temple. Thanks for adding a quote here from Joseph. As I read it I think it helps dispel the temples dotting the earth statements made by Brigham and repeated by more recent church leaders. This statement seems to suggest only a small number of temples in “various parts.” I believe I said that Joseph only indicated there would be two “locations” where we would have temples: New and Old Jerusalem. The “various parts” may be referencing the place then established as Zion which was Nauvoo. The actual location of Zion was to have eventually 12 temples all in one place. As to your thoughts on tithing and section 119 I’d have to research that a little more. Remember the saints were also supposed to live the law of consecration and so at that point all surplus property was being given to build Zion. I would not disagree that that these surpluses were not being used to build the temple. I think it’s a valid point that it was not just a temple fund. But we’ve turned the principle on its head today by obsessing with our temple and church building rather than focusing on the poor with our tithes. Im confused about this whole temple project. I dont understand how we think we can press forward with anything to do with this project. The covenant of the Book of Mormon was never completed and the times of the gentiles has now closed. The original remnant of Lehi’s seed have not been recovered. I understand that the church claims it did so by taking the Book of Mormon to them, along with the indian placemant program. The church did deliver the Book of Mormon to them along with a religion filled with gentile precepts and commandments of men. I fear we have drug with us from the LDS church the notion that we are Ephraim and that this is our right to take a lead role in the building of the temple and New Jerusaem. Zechariah 6:12-13 explains very clear who will build the temple of the Lord. A man whose name is “The BRANCH”. The Branch has refernce to a geneology found with the branch that was broken off to be remembered that is found in the Book of Mormon. This man will come from a direct lineal descent from Father Lehi. It is also through this lineage that the remant of Joseph will be found who will build the New Jerusalem. The BRANCh is also a name for the One Mighty and Strong. I understand that many people believe that Denver is this man and Denver has never confirmed or denied this claim. I do not believe that it is the right or blessing of this movement to begin anything related to the construction or preparation to begin a temple. It appears to me that we are trying to hasten the work “that we may see it”. Isaiah gives a steep warning against this very thing in chapter five. The direction i see things moving in right now says to me that this is nothing more than round two for the gentiles. If Denver is the man who is called the One Mighty and Strong then he needs to declare it boldly. If he is not this man then he needs do declare it boldly. No communication on this has lead to miscommunication and this has and will quickly lead to people coming to wrong conclusions. By not delcaring that he is or is not this end time Seer is doing the same thing with the people looking to him that the fifteen in Salt Lake have done with their presumed mantle of Prophet, Seer and Revelator to the members of the church. Thank you for your blog and your work. As I regularly read your posts, I am frequently caused to examine and/or reexamine aspects of the gospel, and I appreciate the same. One of the aspects of your blog that appeals to me is the scripturally based, as well as very thoughtful and rationale, approach that you take to your topics and writing. This post, however, has left me disappointed, and I wanted to leave this comment in hopes that you or others may help me to see what I am missing, and/or that some modicum of what is expressed in this comment may be helpful to others. 2 Behold, I say unto you, were it not for the transgressions of my people, speaking concerning the church and not individuals, they might have been redeemed even now. 5 And Zion cannot be built up unless it is by the principles of the law of the celestial kingdom; otherwise I cannot receive her unto myself. (2)	In other accounts of folks being commanded to build temples or tabernacles, the Lord seems to require more than a gift of $100 as suggested in this post (see, e.g., Exodus 31, History of the Church, 4:434.). The suggestion of $100 in this posting does not appear congruent with the level of sacrifice that the Lord seeks. As I next mention, it appears to be, at best, lukewarm. (3)	Multiple scriptures at least suggest that we ought to act with full purpose of heart, including in our giving (see, e.g., 3 Ne. 18: 32, 2 Cor. 9: 7). The Lord himself indicates that if we are “lukewarm,” He will spit us out of His mouth (Rev. 3: 16). And this is where I have trouble. The invitation in this posting appears to me to be lukewarm. If this effort is of the Lord, we should be in for more than $100. If it’s not of the Lord, then does it matter? These ideas of “what’s the worst that could happen?” and “so why not give?” appear lukewarm, and—if taken to their logical conclusion—invite us to engage in all types of experiments ill-advised or otherwise because, “what’s the worst that could happen?” There is dangerous territory there. If it’s of the Lord, then we ought to say so. But soliciting money because “what’s the worst that could happen?” seems akin to nothing more than blatant solicitation, salesmanship, and at worst manipulation. I would suggest that the baptism ordinance has also been corrupted. The church does not use the prayer recorded in the BoM as given by Christ himself and instead uses an altered version as recorded in the D&C. Well please share. What do CES folks make? My guess is the Church pays their relocation expenses and buys their house, or gives them an allowance of up to $1500 or $2000 for housing? PLUS insurance. PLUS gas expense or PLUS buys them a car. All of that is around $75,000 let’s say. On top off all of that I’m guessing they get paid AT LEAST $80,000/year. PLUS a pension that allow them to retire comfortably after working 20-25 years, when they can draw probably $70,000 a year. In summary, total comp would be easily $155,000/year not including their pension. Including their pension, total comp would have to approach $200,000/year. Whatever the number, how fortunate they are to get paid to study the scriptures! Thanks for your thoughts. There are others who have spent more time on this recent topic who have used great scriptural support. If you’re looking to research more I’d recommend the most recent to the remnant posts, which I think are well done. Thanks! Hi Seeker, No I don’t think you are correct about who has the correct baptismal prayer. You have to remember that Nephi the 3rd or one of them was keeping the records at the time that Christ appeared to them. Christ didn’t write the record but Nephi did. The baptismal prayer is recorded in 3rd Nephi. It may have come directly from Christ to the Nephites but it’s obvious that Nephi must have gotten it wrong when he wrote it down. It appears to me that the Nephites and Lamanites particularly after the coming of Christ weren’t performing the baptism correctly and therefore they all were not really baptized. There may have been apostles and prophets among them but they certainly were not baptized correctly. Not only that but these records were abridged and so it might be that Mormon got it all messed up too. Mormon may not have been baptized correctly either if they were using the corrupted prayer as recorded in 3rd Nephi. Now Joseph Smith on the other hand received the revelation as to the baptismal prayer in April 1830 and it is recorded in D&C 20. No translation was necessary of this prayer because it was given to Joseph in English. Christ spoke directly to Joseph Smith and as such this is the correct prayer whereas the Nephites obviously did not have it correct and therefore were not baptized correctly. Anyway, I think all the ordinances of the temple except for baptism have been corrupted. The correct prayer came to Joseph Smith from the Savior himself and so you can rely on that one. I’d be quite suspicious of the one in the BOM if I were you (wink wink). why does the remnant church complain about transparency while they are often anonymous? I think Dan (see his comment on 1/15/17) makes some good points. But I wonder…could receiving a commandment to build a temple inspire people to “rise up,” as Denver repeatedly teaches? Denver does say we need a temple. He says, “The LDS version of temple rites is insufficient to allow anyone to obtain the right to ascend to God’s presence in eternity. The Lord will fix this, as He intends to establish an Ensign to which all nations (meaning scattered covenant Israel) will return in the last days and there receive their crowns at the hands of servants who will minister covenants for this purpose (D&C 133:31-34)” (April 29, 2016 post on his website). So we need a temple, and Denver says the Lord “will fix this.” And yet, no commandment has been issued. Interesting. Problematic. No doubt people want it, but us wanting it is different from the Lord commanding it, isn’t it? If there is a difference, then this effort can reasonably be said to be hastening the work. Denver seems to be saying that issuing a commandment through him is equivalent to returning to a Strongman model, which he wisely has shown to be guaranteed to fail. But does issuing a commandment or revelation through a true, authorized servant mean necessarily that we are going back to a strongman model? I don’t think so. Can a commandment be received, and then there be no strongman? The Lord will reveal the design of the temple as He has hitherto done, and He will reveal the endowment portion through a true prophet, but the funds collection and building process can be done outside the strongman model. I can understand Denver wanting to defer, sort of like Jonah did till he got the message by being swallowed by a whale, and like Moses in Exodus 4. I bet Denver relates well to this chapter. In Exo 4 Moses comes up with all kinds of arguments for not wanting to be “the strongman.” It seems to me like we are right smack in the middle of a chapter in Denver’s life where he is putting forth all these arguments on why he shouldn’t be the mouthpiece of the Lord. Assuming he is a true prophet. But the more he defers acknowledging who he is, the more confusion and doubts arise. Is this what the Lord wants? Are we to be kept in a state of limbo? The pattern has always been: restoration then apostasy then restoration. If Denver is restoring truth again (and I think he has and is), then why stall on declaring with authority the mind and will of God regarding temple building? Unless a time of confusion and doubt is what the Lord wants. So we now wait on the Lord. With reference to the temple, it does sort of seem like we’re getting the cart before the horse. No commandment has been received, but the apparent appointed voice believes APPARENTLY that issuing such a commandment is equivalent to him becoming the strongman. I believe Denver has been very effective in shunning and even denouncing followers of himself, while pointing everybody to Christ. Good for him. Being so anti priestcraft is a sign to me that he’s the real deal. But is it possible that he’s acting too much like the pre-whale Jonah or Moses in Exo 4? Maybe we the people of modern Ninevah will rise up, as Denver says we need to. Is desiring further light and knowledge from the Lord about the building of a temple a sin of impatience? Forgive me if so. Is it a sin to prepare to build and even build a temple that we are not commanded to build? One could argue it’s sort of like the people wanting to build the Tower of Babel. Could some of them have good intentions? This is a time of universal deceit. The apostles of the LDS Church engage in deceit by insinuating they are true prophets, when they have no such fruit. Could Denver by not declaring that he is or is not this end time Seer, as Dan said above, be doing the same thing with the remnant folks who are looking to him? Perhaps we’re not supposed to have any more human shepherds. Denver quoted without commentary Ezek 34. Perhaps Denver refuses to be a shepherd and we are barking up the wrong tree asking him to ask the Lord for guidance because the Lord says, “Behold, I am against the shepherds…” (v. 10). Perhaps Denver doesn’t feel inclined to acquiesce as the Brother of Jared did in Ether 1. The Jaredites didn’t listen to Jared or the Br. of Jared and ended up first in captivity and then destroyed. They both argued against a strongman model. As did Mosiah and Alma. As does Denver. I’ve got questions and doubts. Am I saying or asking anything unreasonably? I pray for guidance and clarity from the Lord. It is interesting to watch this play out. Indeed, it’s a very strange act. I feel incredibly blessed to be living today. Wonder in the end the whole thing about “Temples” is really just about the personal “Temple” you are creating each day? More clarity and confirmation of this reality is found in 3Ne 21:5-6; 9-29. I concur that we have not witnessed revelation as a basis for endless temple construction projects. I concur from reading Joseph’s words, he did not reveal the globe dotted with temples, rather he invited a commitment to celestial laws which included the United Order and caring for the poor. As a witness to changing temple ordinances, and a daughter of God desiring to attain again His association, my study of scripture repeatedly reveals our leadership truly fulfills Isaiah’s description of them in the last days. Myself and family have sacrificed for decades to research and complete temple work for our family. Now we “hope” that at least the baptisms are valid, and we know the “records” we have presented are kept safely by the Lord in readiness for repeat ordinance work during the millennium. We have been blessed often by the association of our ancestors in the temple, we love them and they know it. While what I state next may be in error, provocative or considered bizarre, I have an ongoing concern that my dead are as attached to the LDS Church as I’ve been for 53 years and work will be required to pull them away from the Church and redirect their allegiance to Christ and the latter-day Church of Christ ( first born). I say this because we are told we have the same disposition and sociability in the spirit world we possessed in mortality. Unless they witness the evolution of my testimony in the past 2 years, my awareness of the need to reconstruct my testimony on Christ, Joseph and the scriptures rather than the ” follow the prophet” model. I pray more of the saints will “awaken” to the truth before they are forever robbed of the blessings they can eternally enjoy. I thought you said Obama was not leaving the White House? Good thing I’m not a prophet. I thought so because Obama had signed an executive order in 2012 number 13603 that said that in an emergency like Martial law he had the authority to take control of all food, water, power etc in this nation. It would have set him up as a dictator. It didn’t happen of course but I thought so based on his behavior. I know they were stunned that Hillary was not elected because Obama wanted his agenda to continue. So that was my reasoning simply based on his behavior. Oh well, now Trump is the president and we’ll see how that all shakes out. With all the protests going on it does look like civil war isn’t too far off. Isa 19:2. I will stir up the Egyptians against the Egyptians; they will fight brother against brother and neighbor against neighbor, city against city and state against state. As the ancient Chinese proverb says: May you live in interesting times. Both can be found in the Joseph Smith Papers. I’m not sure which is earlier, but both indicate that the earlier documents (of the revelation that became D&C 20) show the wording should be as it was translated in the Book of Mormon. The D&C has many changes over the years, some (such as this one), even during JS’ lifetime. Records suggest that he was focused on the Lectures on Faith, while a committee oversaw the other part of the D&C. In the BOM, the Lord had to send an outsider to fix what was broken from within, (Samuel the Lamanite). This building hundreds of Temples reminds me of something the Lord condemned & convicted the Zoramites of doing. Of course the Lord has plans to build the two Temples He mentions building in the scriptures. That’s His Plan. Of COURSE they will not be built by the current Zoramite leadership who believe in keeping the sheep SEPARATED for control purposes, rather than GATHERING the Lord’s Sheep to instruct them in His Ways and to build Zion. They are men out to seek their Own Gain. A House Separated can not stand, nor be Gathered. God’s desire is to GATHER His Sheep. But only the more obedient ones who seek for a True Shepard to lead them, when the Lord sends another Samuel, like unto Moses. From the looks of things around us now, that won’t be long.